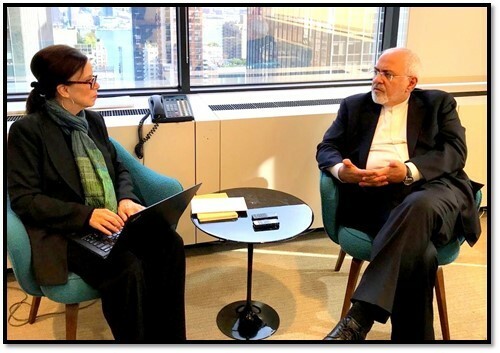 Robin Wright had two interviews with Iranian Foreign Minister Mohammad Javad Zarif during his week-long trip to the United Nations in New York. One was one-on-one, and the second was with a group of journalists. The following are excerpts arranged by issues. Wright: We've had an interesting week of speeches by the president, the national security advisor and the secretary of state on Iran. What do you make of U.S. policy now, and what do you think U.S. goals are? Zarif told Wright: I think all those statements [by President Trump and other officials] were basically repetition of old rhetoric that was used. I think what was significant this week was that U.S. isolation was on display both in the General Assembly and in the Security Council. But that's what's new. We live in a world of possibilities, so nothing is impossible, but we need to see. First of all, we're not angry. And I don't think President Rouhani's words [at the U.N. General Assembly] were angry, at all. Of course, President Trump was very angry, mostly with his predecessors… but we're not angry. We are just passionate people who believe that if we start talking to somebody, we need to have some confidence that this is not, as President Rouhani said, just a photo opportunity. I'm not ruling out the prospect of talks provided that the necessary conditions for talks, and that is reliability. You never start talks based on mutual trust. No negotiations are based on mutual trust. The JCPOA (Joint Comprehensive Plan of Action, the nuclear deal) was not based on mutual trust. If you have mutual trust, a two-page document would be enough. Then you have a 150-page document [the JCPOA] dealing with every detail of even how to leave the document, which the United States didn't observe. Then it is based on mutual distrust. But it has to be based on reliability. Reliability is different than trust. Reliability is that when you sign something you are bound by it. Pacta sunt servanda (“treaties shall be complied with” in Latin) is the old idiom, the basis of international relations. Otherwise everything will fall apart. I believe the problem is United States failing to recognize the realities in our region, and I think that has been the root of most of our problems. They're looking to contain Iran, to exclude Iran from this region, but what they're doing is creating more chaos, more extremism, more uncertainty, more instability. I mean they should sit down and simply ask themselves, “what got us here?” President Trump says, “we spend seven trillion dollars in the Middle East and got nowhere.” So why is he repeating the same mistakes? Is he doing anything different? Now he may not be spending that money. He may be asking Saudi Arabia to spend the money for him, but it's the same policy, doesn't matter who's spending the money. What got you into the misery that you are in right now in the Middle East is the policy not who paid the money, because I believe you got twice as much back from these poor people in the Middle East. It's the policy that's the problem, and I believe the United States would be well-off, if they started re-examining the policy that got you here. Zarif told Wright and a group of journalists: I believe the current difficulties that we're facing are difficulties that have been created by both sanctions, which have been having an effect even before they came into effect, because sanctions work psychologically… and the psychological impact of sanctions started when Trump came to office. So, the business community may get threatened may withdraw. But this is short term because people will come to their senses that they cannot put up with this bully I said I told you we have seven millennia of history. We've had an empire that lasted longer lasted longer than the entire life of the United States. We controlled the world for a period that lasted much longer than the entire life of the United States. So, we have our patience, we will not succumb to bullying because a couple of businesses decided to leave Iran. Question: If the special [mechanism] that Europeans are trying to do doesn't work, if the power of Trump’s secondary sanctions is just too great to overwhelm, [do] you see the possibility of Iran pulling out of the deal and resuming the enrichment of uranium? Zarif: Yes. ... Private companies need assurances and need protection but, governments I mean the governments from Americas to Africa to Europe to Asia, who want to do business with Iran. But they tell us, even the Russians tell us, that they cannot control their private companies. So now we need a mechanism to ensure that private companies can do business with Iran without fearing [U.S. sanctions]. Now, whether they can in fact turn that road map into practical vehicles including the SPV (special purpose vehicle) is a question that can only be answered when that mechanism is in place, to see whether they can they can operate it in a satisfactory way. Zarif to Wright and a group of journalists: What is the source of this nightmare in Syria other than other than the United States and Saudi Arabia deciding seven years ago that they could topple the Assad regime in three weeks? Other than the Qataris believing that Assad would be out of government before the end of Ramadan? And we have had seven Ramadans since then, and the people of Syria have gotten killed and maimed and displaced, and you blame Assad. We have not sent troops anywhere we were not asked. We have not bombed any country. We have not taken territory from any country. We are content with our sites, with our geography with our resources. We had no eye on anybody else's territory resources or people. We are content. Can he say that? Can he, [Israeli Prime Minister Benjamin] Netanyahu, make the same statement? We will never use our missiles except in self-defense. Can he make that very simple statement? That's a challenge. I see the perspective of an ideal region, a region that doesn't have a dominant power, a region that can work with each other, can complement each other in, a region where the security of every state is as important for that state as it is for its neighbors, and a region. And I'm talking about our immediate neighbors in Persian Gulf, which has been the scene of the bloodiest conflict in the past 40 years. So, this is the region I want to see, and the role of Iran that I want to see in this region. Is a role of a good neighbor and a good partner. I want to see more economic cooperation between the countries in the region. I want to see a region where members of that region do not try to purchase their security from outside at the expense of insecurity of others. This is my perspective about the future of the region, and in this perspective, every single country in the region is respected and has a role to play. Question: You say that Iran is not being aggressive against another country, but you’ve provided more than 10,000 missiles to Hezbollah in Lebanon… and you provide equipment to the Houthis that have used it… aggressively against Saudi Arabia. Zarif to Wright and a group of journalists: Saudi Arabia is using American bombs to bomb the hell out of Yemeni civilians… it’s not our missiles, first of all. … But Saudis are bombing school buses. They're committing crimes against humanity with American bombs. And the United States is providing air support for that. The United States is providing target support for that and the United States is supporting boots on the ground for that. Now who's committing aggression and who is committing defense?